One of the more common questions we’ve been getting lately is where “the place to be” is for Force Friday. It’s a question I’ve wondered myself considering the dearth of information out there. We do know that some stores will be having exclusives. I’m fairly certain Toys “R” Us and Walgreens are among those featuring Star Wars: The Force Awakens exclusives. We don’t know much else. But if there’s been one thing consistent since at least Star Wars Celebration Anaheim is that Toys “R” Us is clearly trying to position itself (smartly) as the premier place for Star Wars collectibles this fall. Toys “R” Us announced today that it will launch all-new Star Wars Saga products on Force Friday, September 4th, with worldwide midnight opening events, including exclusive giveaways. Also, their international flagship store, Toys “R” Us Times Square in New York City, will host a historic Star Wars toy exhibition with costumed characters, signing events, giveaways, and more all day on Thursday, September 3rd. The event will feature some collections from Rancho Obi-Wan, and have Steve Sansweet and artist Jeff Carlisle. It also looks like they’ll be having some cool exclusives like an exclusive Lego build, which is always popular. Check below for all the details and leave a comment about where you plan to be on Force Friday! When the clock strikes 12:01am on September 4, all Toys“R”Us stores in the U.S. will open their doors, giving customers the opportunity to be among the first to purchase hundreds of new Star Wars playthings, including a wide variety of merchandise they can’t find anywhere else. * As an added bonus, little Jedi Knights and their families attending midnight opening events will have the chance to receive special giveaways, including a limited edition LEGO® Star Wars Commemorative Brick and an exclusive Star Wars poster, while supplies last. ** Also at midnight on Force Friday, shoppers will be able to browse and purchase the new products online at Toysrus.com/StarWars. · A book signing and meet and greet with Steve Sansweet, Chief Executive Officer and President of Rancho Obi-Wan, Inc., storied Star Wars author and former Head of Fan Relations and Director of Content Management at Lucasfilm Ltd.
· An art class and meet and greet with fan-favorite Star Wars and science fiction artist, Jeff Carlisle. · Star Wars product demonstrations and activations throughout the store, including Star Wars-themed 3-D action figure creation with 3D Plus Me, video gaming on Disney Infinity 3.0 Star Wars kiosks and experiencing intergalactic sound on Star Wars-themed headphones powered by SMS Audio. · A LEGO Star Wars make and take for rebels looking to build their toy empire brick by brick. · A Light Saber Academy with members of New York Jedi, a community of cosplayers, martial artists and teachers who share practical stage combat techniques oriented toward Light Sabers. · Photo opportunities with costumed characters, including Furbacca, a character versioned after the Hasbro® toy that makes wookiee sounds like CHEWBACCA, Geoffrey the Giraffe and more. · Ice cream flavors inspired by the Star Wars Saga from Scoops“R”Us™, the flagship store’s in-house ice cream shop located on the Lower Level. · Star Wars-themed cookie decorating at a “Wookiee” Cookie Party on Level 1. · Star Wars trivia, a costume contest and a galaxy of excitement and prizes, while supplies last, for those fanatics waiting in line. · A panel discussion with Steve Sansweet and Jeff Carlisle for select lucky fans, which will also be livestreamed via Periscope @Toysrus on Twitter. 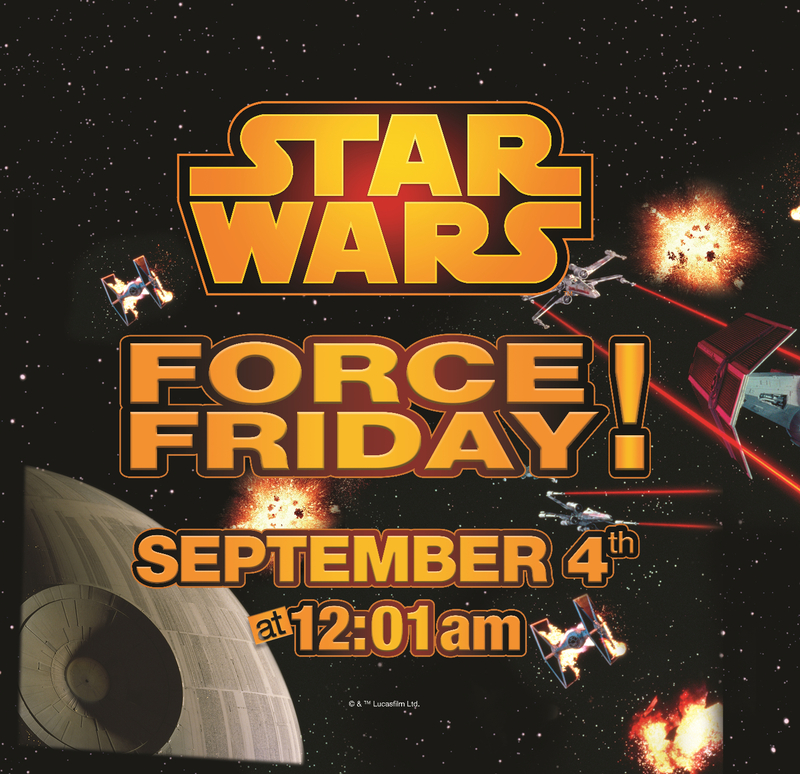 · The ultimate unveiling of the official Toys“R”Us Times Square Star Wars feature shop at 12:01am on Force Friday, September 4. *Toys“R”Us stores in the U.S. will open at 12:01am local time on Friday, September 4, except for stores in Paramus, NJ, which have varying store open times due to local ordinances. Toys“R”Us Express and Outlet locations generally follow the hours of their respective shopping centers. All store hours can be found online at www.Toysrus.com/StoreLocator. ***Event open to all ages. Parental supervision required at all times. All giveaways and event materials available while supplies last and distributed to event participants only. Limit one per person. Quantities limited; no rain checks. ****Toy enthusiasts can view the entire listing of products featured in “Destination: Star Wars – The Experience” and a full schedule of Toys“R”Us Times Square events, including times, online at the company’s Times Square Store Special Events page. Toys“R”Us, Inc. is the world’s leading dedicated toy and baby products retailer, offering a differentiated shopping experience through its family of brands. Merchandise is sold in 864 Toys“R”Us and Babies“R”Us stores in the United States, Puerto Rico and Guam, and in more than 730 international stores and over 240 licensed stores in 37 countries and jurisdictions. In addition, it exclusively operates the legendary FAO Schwarz brand and sells extraordinary toys at FAO.com. With its strong portfolio of e-commerce sites including Toysrus.com, Babiesrus.com and FAO.com, it provides shoppers with a broad online selection of distinctive toy and baby products. Headquartered in Wayne, NJ, Toys“R”Us, Inc. employs approximately 66,000 associates annually worldwide. The company is committed to serving its communities as a caring and reputable neighbor through programs dedicated to keeping kids safe and helping them in times of need. Additional information about Toys“R”Us, Inc. can be found on Toysrusinc.com. Follow Toys“R”Us, Babies“R”Us and FAO Schwarz on Facebook at Facebook.com/Toysrus, Facebook.com/Babiesrus and Facebook.com/FAO and on Twitter at Twitter.com/Toysrus, Twitter.com/Babiesrus and Twitter.com/FAOSchwarz.